SHE'S the speed eater who can down thousands of calories in just a few mouthfuls. 25-year-old Nela Zisser is New Zealand's top competitive eater, despite only weighing 50kg. Earlier this week, footage of the model and first-year medicine student went viral after she downed a whole jar of Nutella in under three minutes. But despite her size, Mrs Zisser said to her, competitive eating is no joke, and she considers it a competitive sport which requires extensive training and fitness. 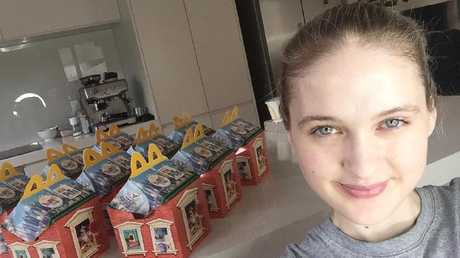 "I started when I was 21 after my mum talked me in to competing in a pizza eating contest," Mrs Zisser told news.com.au. "I qualified, and ate the pizza really quickly and had the best time. I beat 19 really big guys too. "To do something like this you have to be fit....it's very difficult, so you have to have good fitness to do it." Mrs Zisser said people often ask how she maintains her frame without putting on weight - especially when she challenges herself to eat 22 Big Macs in an hour, or a 10,000 calorie English breakfast in a single sitting. Nela inhaled a 10,000 calorie breakfast which was viewed more than one million times. "I walk around a lot, and I'm very busy but I don't go to the gym," she said. "For me to eat 10,000 calories is very rare. The 4000 calorie Nutella challenge was the first I'd done in two or three months. "I used to do challenges weekly, but I was gaining a lot of weight, so now I just do them every couple of months. So because I don't do this often, your body doesn't process that many calories if you eat it in one go. So I may weigh a kilo or two more the next day, but the following week it evens itself out." 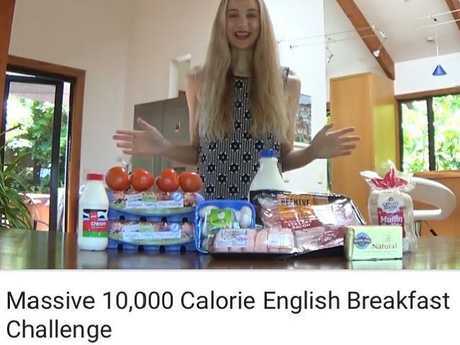 Mrs Zisser, who films her eating for her Youtube channel, said the competitive challenges - which have seen her compete around New Zealand and in the US - often require consuming pizza, burgers, chips or other sweet foods. To date, she's inhaled a 1kg burrito in under two minutes, 22 Big Macs in an hour, and even five foot-long Subway sandwich in under 10 minutes. "This is basically a sport," the first-year medicine student said. Nela has done numerous challenges where she eats huge servings of McDonalds. "I don't breathe while eating, your body stops you from doing that. So you do some practice ... but you don't really taste the food. "With competitive eating, you're not really tasting the food. You change your senses, so you just eat for enjoyment. "My husband finds it very entertaining, but it's something you have to want to do. I guess you're born to do it."